their spaces. Once healthcare providers enter their test requests, patients may report immediately to the Laboratory Department, where specimens are obtained and tests are performed. Use of Laboratory Request Forms Write information on the SF laboratory request forms in black or blue-black ink. Use a separate SF laboratory request form for each patient and for each test. Document the patients full name, family member prefix and social security number, rate/rank, dependency status, branch of service, and status in the Patient Identification block. Also identify the ward or department ordering the test in this block. See figure 7-1 for an illustration of the Urinalysis request form, SF-550. Computer-generated laboratory test requests require the same patient identification data as SF laboratory requests. Since the results of the requested laboratory test are usually closely associated with the patients health and treatment, the requesting healthcare providers name should also be clearly stated in the Requesting Physicians Signature block on the request form (fig. 7-1). The doctor requesting the urinalysis should sign in this block. 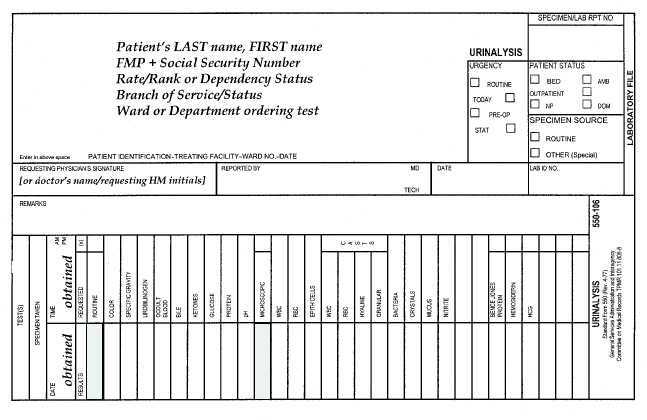 Alternatively, you may type/print the doctors name in the block and initial the entry to authenticate it. This practice ensures that the report will get back to the provider as soon as possible. Enter the requested test in the Remarks block (e.g., Clean catch midstream to R/O urinary tract infection). Because the data requested, the date reported, and the time of specimen collection are usually important in support of the clinical picture, these pieces of information should be clearly written on the request in the areas provided for them (fig. 7-1). Patient and Specimen Identification Before accepting laboratory request forms and s p e c i m e n s i n t h e l a b o r a t o r y, c h e c k p a t i e n t identification information on both the request form and the specimen container label for completeness and legibility. Proper documentation of patient identification information on these items can prevent a great number of errors. Also, make sure the specimen(s) submitted is in fact the specimen of the patient submitting it. You need not stand over the patient while the specimen is being collected; however, keep in mind that for certain tests (such as drug or alcohol screening tests) individuals may attempt to substitute specimens. 7-2 HM3f0701 Figure 7-1.SF-550, Urinalysis Request Form.